In this episode of Community Organizer, Scott Clapson sits down with Lindy McClean, co-founder of Coastline Neighbors, and volunteers Don and Martha Villele to talk about their newly formed non-profit and their passion to help Curry County residents live in their own homes as long as possible. Hear about the concept of the Village Movement, the awesome opportunity to become a volunteer, and how Coastline Neighbors can help someone you know. Come be a part of the Community Chat on March 22 from 3:00 – 3:59 PM at the Chetco Community Public Library Annex, 402 Alder Street in Brookings. 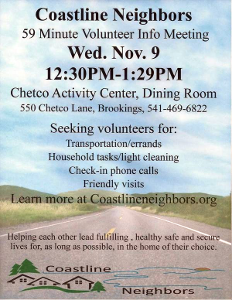 You can contact Coastline Neighbors to apply to volunteer at 541-313-6490. Visit them on-line at CoastlineNeighbors.org. In this episode of Community Organizer, Scott Clapson sits down with Tina Gardner to talk about her involvement in the Azalea Pageant Committee. Tina and Scott talk about how the Brookings-Harbor community is coming together to organize this years pageant. Tina shares with Scott why pageants like this are so important for teaching young women in our communities about activism, leadership, and community participation. 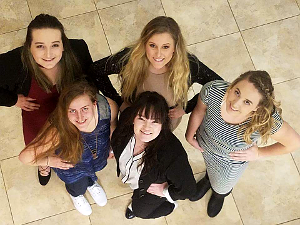 The Azalea Pageant Committee is working with the young women in preparation for the pageant that is scheduled for May 5th at the Nazarene Church in Brookings. The theme for this years pageant is A Blast From the Past, and they will be honoring first responders. Please like and share the Azalea Pageant Committee Facebook page! You can contact them at azaleapageant2017@gmail.com. Photo provided by the Azalea Pageant Committee. In this episode of Community Organizer, Scott Clapson sits down with Pattie Slagle of Coastline Neighbors to talk about volunteer opportunities with Coastline Neighbors, a new local aging-in-place nonprofit for seniors. Based on a national model called the Village to Village Network, Coastline Neighbors is about neighbors helping neighbors. Coastline Neighbors is an all volunteer run organization. Pattie shares with Scott why she got involved with Coastline Neighbors and why an organization like this is so important to support seniors in our community. Volunteer opportunities include transportation, light cleaning or housework, handyman work, and daily check in calls. 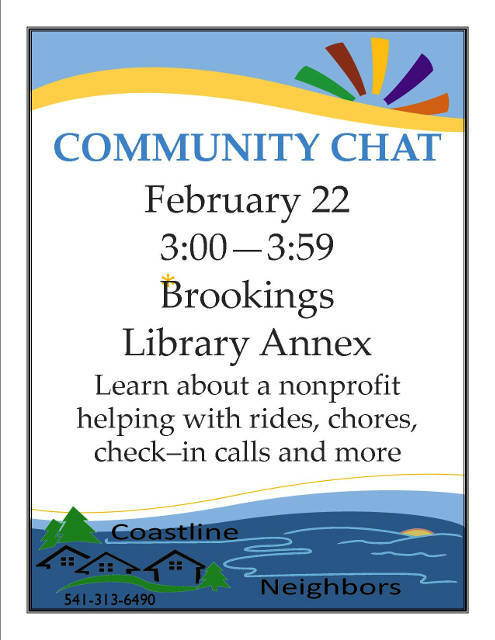 Coastline Neighbors has a community volunteer meeting coming up on Wednesday, February 22 at 3:00 PM at the Chetco Community Public Library Annex, 402 Alder Street in Brookings. In this episode of Community Organizer, Scott Clapson sits down with Sandy Griffith, Eleanor Cook, and Keith Jones from the Chetco Grange to talk about their recent recognition as a Distinguished Grange by the National Grange. This is the first time the Chetco Grange has received the recognition, and it was accomplished by everyone bringing their talents and gifts to make this community organization vibrant and dynamic. The Chetco Grange is not only a place to rent for parties and events, the members of the Chetco Grange host ballroom and line dance classes, Tai Chi classes, concerts and dances, and other local events. Their most recent event was the Christmas Fair in December. 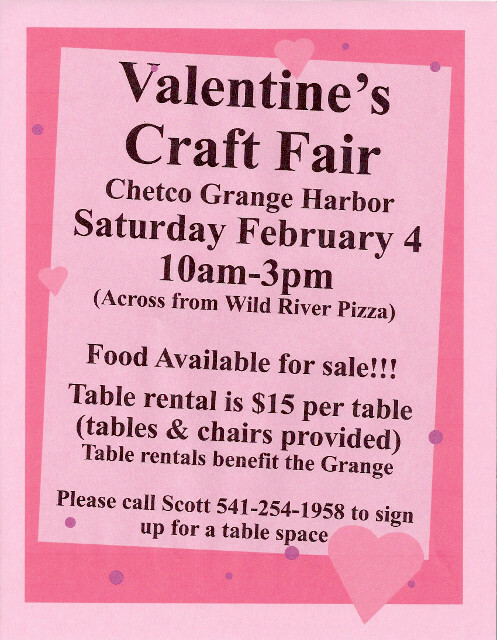 This event, with vendors, food sales, and live music, was so successful that Chetco Grange members are planning to build on their success with a special Valentine’s Craft Fair on Saturday, February 4, from 10:00 AM to 3:00 PM at the Chetco Grange Hall. 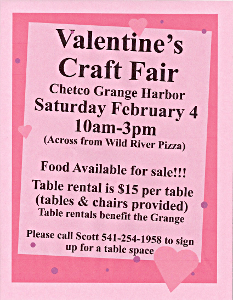 Table rental for vendors is $15 dollars, with revenue benefiting the Chetco Grange. Food will be on sale from the Grange kitchen, and Keith Jones will be playing live music! If you are interested in this events, renting the hall, or joining the Chetco Grange, you can get more information from their website, ChetcoGrange.org, and their Facebook page. Happy Valentine’s Day from the Chetco Grange! Music is Little Lily Swing by Tri-Tachyon, from freemusicarchive.org, Creative Commons Attribution 4.0 International license. In this episode of Community Organizer, Lindy McClean sits down with community organizer Scott Clapson to talk about the new nonprofit, Coastline Neighbors, a volunteer-based organization providing support for local seniors to “age in place” in their own homes. Coastline Neighbors is based on a nation model called the Village to Village Network. Sometimes we all need a little support from those around us. Coastline Neighbors connects members with volunteers for tasks such as transportation, light housework, check in phone calls, and friendly visits. 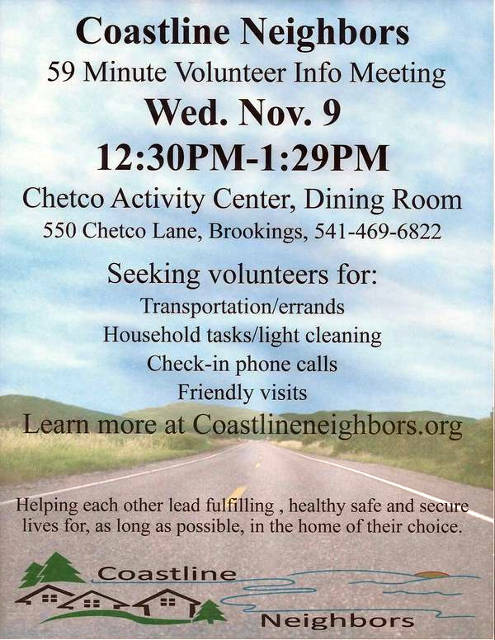 The Chetco Activity Center is hosting a 59-minute informational meeting for volunteers and community members who want to learn more about Coastline Neighbors on Wednesday, November 9th, from 12:30 – 1:29 PM in the dining room at the Chetco Activity Center. For more information, go to coastlineneighbors.org, or call 541-469-0864. 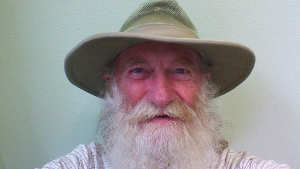 In this episode of Community Organizer, Paul Carlin of the Pelican Bay Amateur Radio Club (PBARC) sits down with community organizer Scott Clapson to talk about PBARC and their extensive community involvement. They have installed radios at many strategic locations around our area. They also teach new interested people about amateur radio. This is a dynamic and engaged group of volunteers. Paul is encouraged by the mutual support and collaboration between PBARC and local fire departments, schools, municipalities, nonprofits, and churches supporting emergency preparedness. He encourages others to get involved in this incredibly important, educational, and engaged community organization. Pelican Bay Amateur Radio Club meets on the last Friday of the month at 6:30 PM downstairs at the Chetco Activity Center. You can learn more about PBARC at pelicanbayarc.com. In this episode of Community Organizer, Joanne Wausbauer sits down with Scott Clapson to talk about our regional public transportation system, Curry Public Transit. Under her leadership Curry Public Transit went from being a dial-a-ride service of the Brookings senior center to it’s own nonprofit corporation. Recently retired as the general manager, Joanne tells listeners how Curry Public Transit grew to be an asset to our entire region and how to take advantage of its services. There are opportunities to catch other regional transit buses at the end of the route in either Coos Bay or Smith River. Curry Public Transit operates a Dial-a-Ride service and Coastal Express from Smith River to Coos Bay. You can schedule a ride with Curry Public Transit by calling 541-412-8806. 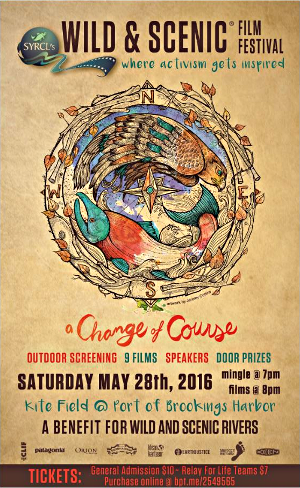 In this episode of Community Organizer, Scott Clapson talks with Alyssa Babin about the Wild & Scenic Film Festival which will take place on Saturday, May 28th, at 7:00 PM at the Port of Brookings-Harbor Kite Field. 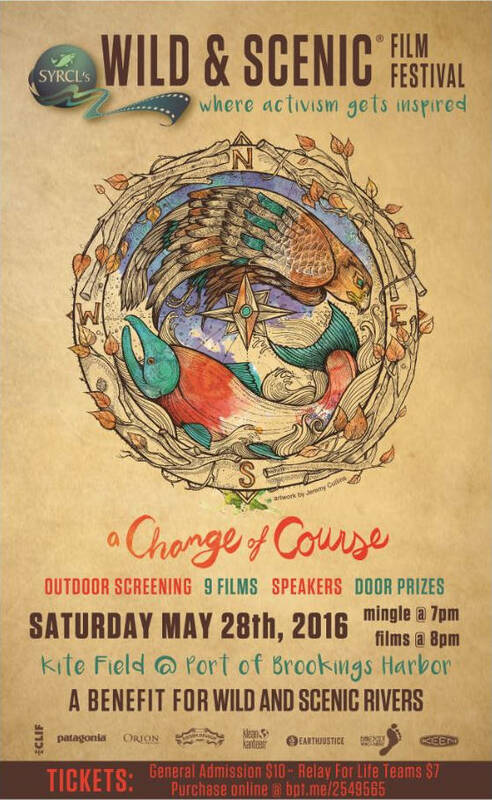 The film festival is hosted by Wild and Scenic Rivers, a local nonprofit focused on protecting and advocating for our wild and scenic natural spaces. Alyssa Babin is the Founder and Executive Director of Wild and Scenic Rivers. Two of the films featured in the evening’s event showcase footage from two of our local rivers. Tickets are $10, and volunteers are needed to help with the event. Special thank you to Relay for Life for cosponsoring the event. For more information contact Alyssa Babin at AlyssaBabin@gmail.com, 415-786-3304. In this episode of Community Organizer, Ira Tozer talks with Scott Clapson about Ira’s upcoming part as Grand Marshal in the 2016 Azalea Festival Parade. They talk about having fun and connecting with other community members at the Chetco Activity Center, where Ira volunteers as a computer teacher and tutor. Ira and Scott share about how we can help support each other in the adverse experiences of our lives, about how everyone has a skill or a talent to contribute, and the need to come together to help transform our world. We all live in community, and we all have gifts to share. Thank you Ira for the love you share with everyone and all the volunteering you do in our community. Be sure to wave to Ira in the Azalea Parade! In this episode of Community Organizer, Alyssa Babin, Secretary of the Azalea Park Foundation, sits down with Community Organizer and fellow Azalea Park Foundation Board Member Scott Clapson to talk about the new Azalea Park Community Garden. 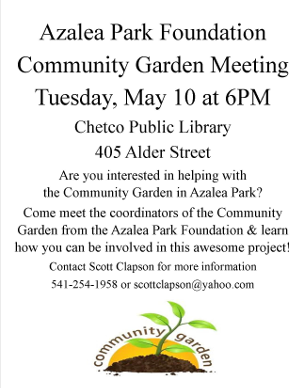 Alyssa and Scott, who are both community garden advocates, share information about the upcoming Volunteer Meeting for the Community Garden in Azalea Park and how they are passionate about including all members of our community in this project. They tell their personal stories about why this project is important to them. The Azalea Park Foundation hopes to begin building the garden in June of this year. 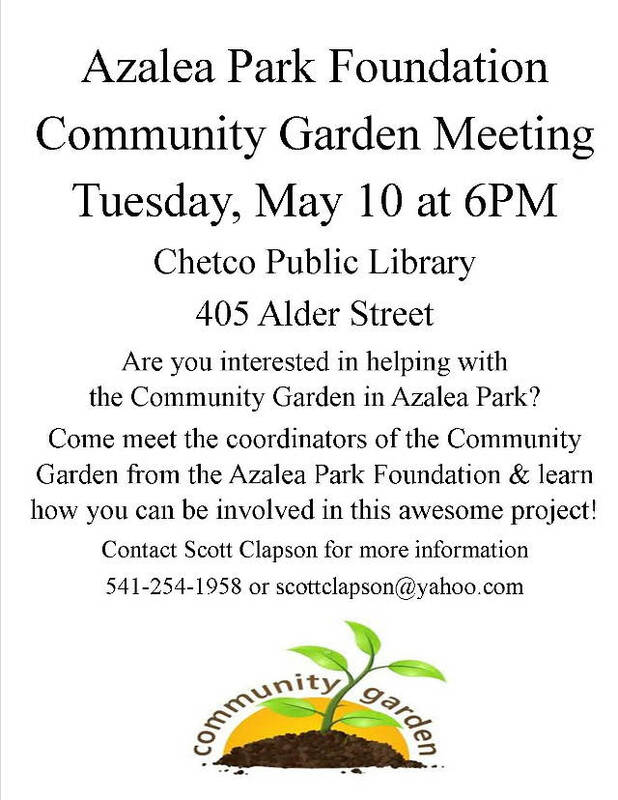 The Azalea Park Foundation Community Garden Volunteer Meeting is Tuesday, May 10th, at 6:00 PM in the large meeting room of the Chetco Community Library. You don’t have to attend the meeting to be a Community Garden volunteer. If you would like to participate, please call Community Garden Coordinator Scott Clapson at 541-254-1958, or email him at scottclapson@yahoo.com. You can find the Azalea Park Foundation on Facebook at https://www.facebook.com/azaleaparkfoundation.